Why Does My Teenager Still Wet the Bed? While many parents understand when their child wets the bed at age 4, bedwetting at age 14 can come as a surprise. Referred to as nocturnal enuresis, bedwetting is actually more common in teenagers than you might think. Studies estimate that about 4 percent of boys and 2 percent of girls wet the bed during adolescence. Many teens outgrow bedwetting before they become adults. By age 18, only about 1.5 percent of males and .5 percent of females still wet the bed. In adults, a full bladder sends a message to the brain that wakes an individual up in the middle of the night. Most kids slowly develop this ability over time. Some of them stop wetting the bed as preschoolers. But others don’t develop this ability until much later in life. Genetics – If both parents wet the bed, a child has a 70 percent chance of being a bedwetter. If one parent wet the bed, the probability of a child wetting the bed is 40 percent. Bladder problems – Some teens have relatively small bladders that can’t hold much urine. Others experience muscle spasms that can lead to nocturnal enuresis. Sleep disorders – Some teens are sound sleepers. They just can’t wake up enough to get up and go to the bathroom before they have an accident. Other teens may have a sleep disorder, like sleep apnea, that makes it hard for them to wake up. 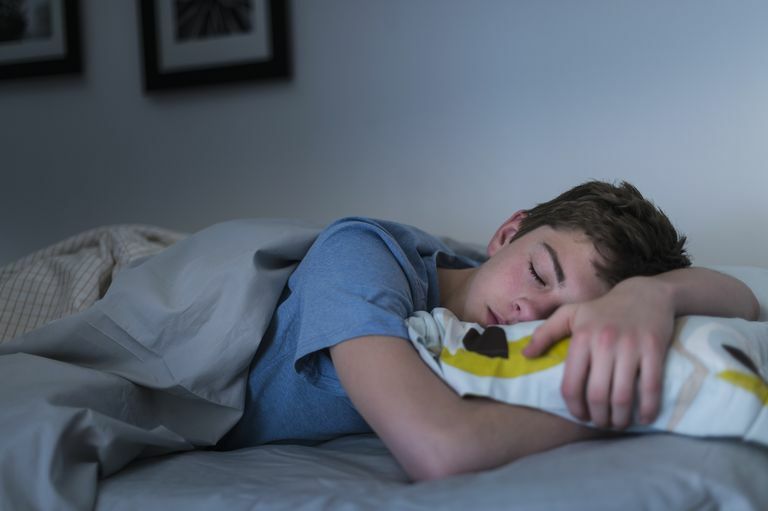 Unusual sleep patterns – Most teens aren’t getting enough sleep on school nights. Consequently, many of them nap during the day or sleep in late on the weekends. Those sleep patterns can interfere with the brain’s normal cycles, which may make it harder for the bladder to communicate with the brain during sleep. Stress – Some experts believe stressful events, like a change in schools or a divorce, could lead to bedwetting. Other experts believe stressed out kids engage in behavior that increases the chances that they’ll wet the bed—like eating salty foods and drinking more fluids at bedtime. Medical issues – Certain medical problems, like urinary tract infections, may lead to sudden bedwetting. Other conditions, like diabetes, constipation, or urinary tract abnormalities may also contribute to bedwetting. Caffeine – Drinking too much caffeine, especially late in the day, may increase the chances a teen will wet the bed. Not only could caffeine interfere with your teen’s sleep but it also increases the amount of urine made by the kidneys. If your teen consumes soda, energy drinks, or other caffeinated beverages, it may be a good idea to curb his caffeine intake. Too much liquid intake at night – Drinking too much water or other beverages late in the evening increases the chances your child will have a full bladder overnight. And if your child doesn’t wake up when his bladder is full, he’ll wet the bed. It’s important to consider whether your teen has always wet the bed or if it’s a new behavior. If bedwetting is a new problem, make sure to rule out any physical or psychological health issues before attempting to treat it. Limit drinks after bedtime. Encourage your teen to stay well hydrated during the day. But limit the amount of liquid he consumes after dinner. Encourage your teen to use the bathroom before bed. It's common for teens to fall asleep using their electronics in bed or to get so busy they forget to use the bathroom. Encourage healthy sleep habits and remind your teen he’ll reduce the chances that he’ll wet the bed if he goes to sleep with an empty bladder. Try a bedwetting alarm. A bedwetting alarm is an alarm designed to wake children up when they begin to wet the bed. A moisture sensor makes a buzzing or beeping noise at the first indication that a child is wetting the bed. The noise should wake up your teen so he can use the restroom. Over time, this behavior modification technique helps your teen learn to recognize a full bladder before he begins to wet the bed. Talk to your teen’s doctor about medication. While there isn’t a single prescription that cures bedwetting, there are medications that might help decrease the amount of urine released by the kidneys or increase the amount of urine the bladder can hold. Talk to your teen’s doctor about the potential risks and benefits of ​a medication. Consider therapy if your teen is experiencing emotional effects. Teens who wet the bed may experience shame, embarrassment, and self-esteem issues. It may also impact your child’s social life. Talk therapy can address body image issues, help her gain confidence, and assist her with the emotional turmoil she may be experiencing. Talk to your teen about your willingness to support her efforts in getting help. Make sure she knows you’re not punishing her by getting an alarm or making her go to therapy because she’s crazy. Get your teen involved in treatment as well. Encourage him to keep a journal or a calendar that tracks his daily activities. He may discover certain foods or drinks seem to trigger bedwetting. Remind your teen that treatment isn’t likely to work immediately. You may need to try several different options and it may take a few months. But, if you work hard to address the problem, you’ll have a better chance of resolving it. Most teens who wet the bed don’t want their peers to know. Consequently, many of them avoid sleepovers, camping trips and outings where their friends may find out they wet the bed. Whether it’s an overnight band trip with her friends or an opportunity to go to basketball camp for the week, encourage your teen to participate. Talk about strategies that will help her keep her bedwetting issue private, even when she’s sleeping in the same room as other people. Consider teen-sized disposal undergarments. Many of them look like regular underwear and your teen’s friends won’t know the difference. Depending on your teen’s weight, you may need to opt for adult-size incontinence products. Problem-solve with your teen regarding strategies he could use to dispose of his undergarment discreetly. Providing a large plastic bag that your teen could place his undergarment in might be a way to prevent his friends from suspecting anything. If your teen is going to a slumber party at a friend’s house, talk about the pros and cons of letting the friend’s parent know ahead of time. The other parent could ensure your teen has an opportunity to discreetly dispose of a disposable undergarment without the other teens knowing. It’s likely your teen won’t want to talk about bedwetting. But, it’s important that you send the message that there’s no reason to be ashamed. This is especially important if you’ve noticed your teen is trying to hide the fact that he wets the bed. Perhaps he’s started changing his sheets more often or maybe you’ve noticed he’s doing more laundry lately. Explain in a matter of fact manner that his brain simply doesn’t wake up him when his bladder is full. But that over time, this will likely change and he’ll stop wetting the bed. Be willing to listen too. Validate your teen’s feelings and acknowledge how bedwetting can be tough. But overall, make sure your teen knows that he isn’t alone. If you wet the bed as a teen, talk about it. And remind him that there are likely other kids at school going through the same thing. Let your teen take responsibility for cleaning up after he’s wet the bed. Request that he do his laundry when he has an accident. Keep a spare set of sheets handy so he can make his own bed after he has an accident. Provide your teen with a mattress pad that will protect the mattress. You can also talk to your teen about mattress underpads. They lay on top of the sheets. Some of them are disposable and others are machine washable. Make sure to respect your teen’s privacy. If he doesn’t want his little brother to know he’s wetting the bed, respect that. And don’t tell Grandma if your teen doesn’t want other people knowing. Avoid getting angry or frustrated with your teen, even when you’ve already cleaned the sheets three times this week. Be kind and supportive and understand that your teen isn’t doing this on purpose. Tai BT, Tai TT, Chang Y-J, Huang K-H. Factors associated with remission of primary nocturnal enuresis and changes of parental perception towards management strategies: A follow-up study. Journal of Pediatric Urology. October 2016. Thurber S. Childhood Enuresis: Current Diagnostic Formulations, Salient Findings, and Effective Treatment Modalities. Archives of Psychiatric Nursing. November 2016.